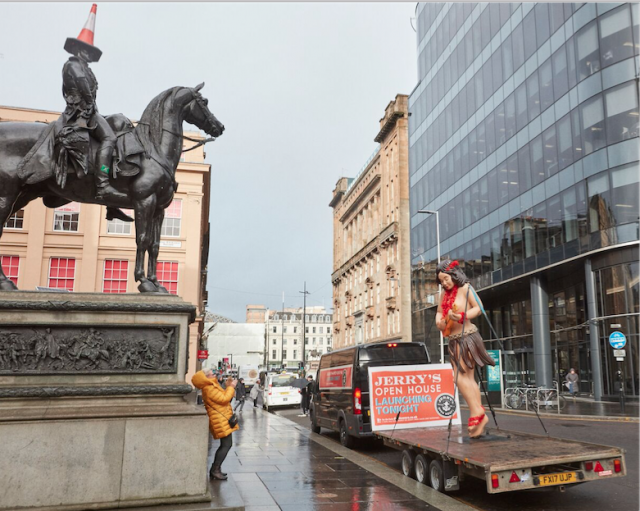 The famous traffic cone-wearing Duke of Wellington statue in Glasgow got a new companion this week. Sailor Jerry Spiced Rum’s statement hula girl was spotted touring Glasgow town centre on Thursday. Her parade marked the opening of Jerry’s Open House; an all-in month-long pop-up in Finneston from 15 February to 15 March inspired by Norman ‘Sailor Jerry’ Collins and celebrating the city’s thriving art and music scene.